The Nottingham Urban Wildlife Scheme (NUWS) has been fighting to save a valuable piece of our environment the Lenton Triangle, situated a few yards south of the Castle Marina and about six hectares in area. It is so named because of its shape, being surrounded on all three sides by railway lines. This relative isolation has afforded it much protection and it is probably the last remaining area of flood meadows once so characteristic of the banks of the River Trent. The eastern part of the site is just an area of tall grasses and scrub, but the wetter western side is felt to have the considerable wildlife value. This wetland area has an excellent diversity of moisture-loving flowering plants including brooklime, hemp agrimony, reedmace, ivy-leaved duckweed and branched bur-reed, all of which are uncommon in an urban setting. Reed and sedge warblers are known to breed here and the grey heron is a regular visitor. Although a detailed survey of the breed here. 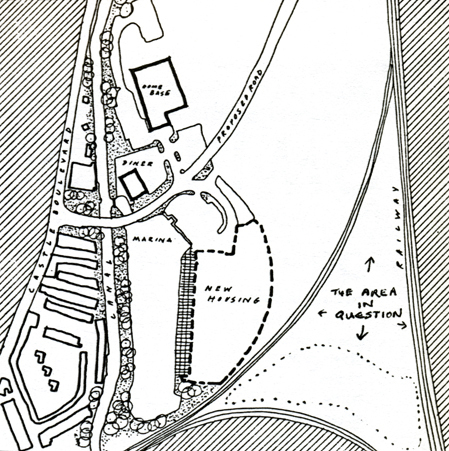 The development of the Castle Marina Park, however, may change all this. It is proposed to take out the northern-most section of railway line and build houses on the eastern side of the triangle. Sadly the development is also planned to encroach on the wetland. Here a lake will be excavated to take storm water from the housing, material deposited to form an open space and tennis courts built. Only a small area of the wetland will be left untouched and kept as a conservation area. NUWS felt that the proposals as they stood would destroy the majority of this excellent wildlife site and that the conservation area would be too small to be a viable nature reserve. Following negotiations with the developers and the City Council a compromise has been reached in principle. This will entail NUWS managing the conservation area, the size of which will be slightly increased. In addition, NUWS will have an input into the design and choice of species to be planted in the open space and lake. NUWS still feel it is a great pity that no more of this increasingly scarce habitat could be saved. Unfortunately they had to accept the compromise as the developer is determined to use the land despite the large size of the overall project. If the minds of the decision makers are going to be changed in other similar circumstances, NUWS needs the support of the community. If you want your voice to be heard in the campaign to preserve and enhance Nottingham's wildlife then why not join the City Group of the Nottinghamshire for Nature Conservation and/or become a supporter of NUWS (*). It could be a small amount of money well spent! (*) NUWS forms part of the Nottinghamshire Wildlife Agency, a Manpower Services Commission funded organisation sponsored by the Nottinghamshire Trust for Nature Conservation. 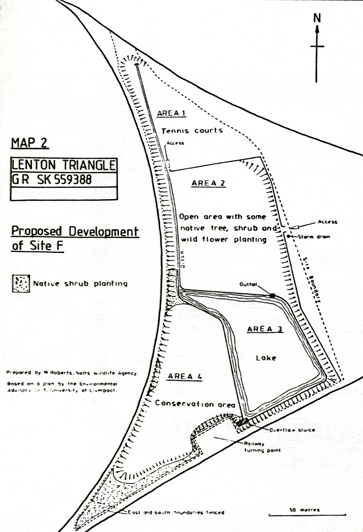 When the article appeared in The Lenton Listener in 1987 there seemed every likelihood that the planned development would go ahead. 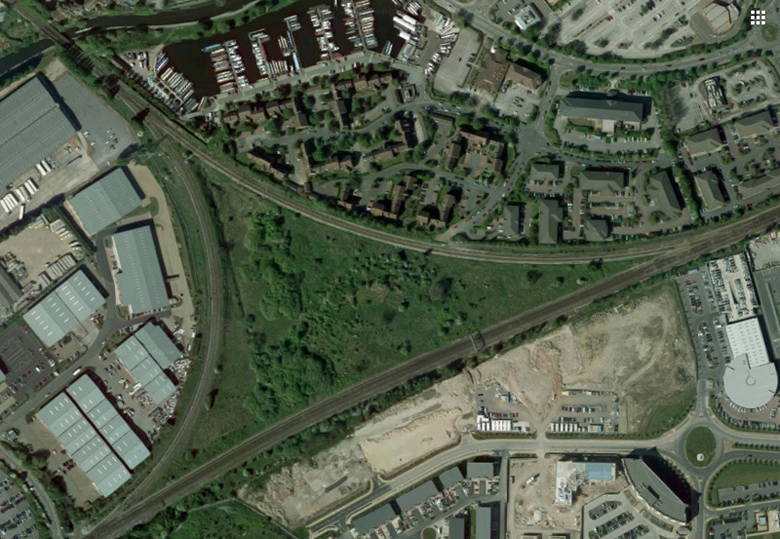 However as this 2013 aerial photograph (courtesy of Google) reveals it never did. So the Lenton Triangle is still with us at the time of writing . A former Lenton resident and one of his friends recently  decided to become modern day explorers and check out the Lenton Railway Triangle. Click here to access his blog post and learn more about his travails within its confines.